russpoldrack.org: To Code or Not to Code (in intro statistics)? I would say definitely code, making it part of the learning process. Students might be scared when they see code and think they might be evaluated on coding, but unfortunately tend to discard the coding part if it's not explicit part of the evaluation, and it's a pity. So I would make it clear from the start that coding is part of the training, and functional to improve the learning, and to express what was learned. thanks Daniele! That is how I tried to do it this time - though it's clear from some of the comments that we didn't do a good enough job integrating the coding content and statistical content. I don't think teaching coding and statistics in one bundle is profitable to learn either. I totally agree that both need to be learned, and not coding these days is a kind of illiteracy. But just as I would not teach English and statistics in the same course, I wouldn't do that to statistics. Either make basic coding skills a prerequisite for the statistics course, or teach statistic concepts in an abstract way without prerequisite and then later get to the applied stuff in a course that does require coding. By the way, I learned to code in SPSS, then R. I only started making sense of R past Stack Overflow copy/paste after I learned Python, and I only made sense of code structure after I learned Haskell. Yes, doing stats provided the motivation to learn to code, but no, R is not a good language to learn coding concepts in. thanks for the thoughts and the interesting analogy. requiring coding as a prereq is a non-starter for this course. Then consider teaching statistics first. Learning works best when the novelty is confined to a single dimension. Or break the course into separate blocks, and teach one (either statistics or coding) in isolation first. stats through lots of simulations, there is no going around R.
several orders of magnitude longer than doing it in JASP. 4. With JASP I know I am not making some sort of stupid programming mistake! This means I don't have to debug my code. This is an clear advantage of GUIs that is missing from your list. Consider advising a student. You either get an analysis output from JASP, or from the student's own R code. Which result do you trust? be sick of having to load the package you need for an ANOVA ("wait, we also needed to code some stuff as factors, right?"). Or will they have forgotten most of it? 6. I don't think the choice between R and JASP is an either-or situation. working to achieve complete synergy with R; this is under development but we are excited about the possibilities for the future. As a post-bach RA in a clinical neuroscience lab aiming to pursue a PhD in Psych/Neuroscience, I wish that I had gotten coding experience during undergrad. I majored in Psychobiology (no coding required for my major) at UCLA, and I feel like I'm playing catch up since coding is pretty essential for fMRI paradigms/processing pipelines/analysis. Personally, I think that integrating stats and coding is parsimonious. I also learned SPSS first in undergrad, then R post grad. There were definitely headbanging moments while learning R, but I wish I could've began to learn it in my first psych stats course despite only having 10 weeks to do so. I strongly believe that the best way to give people an intuitive understanding of statistics is by getting them to simulate data and then run analysis. If you do this, you see a light go on as they get, for the first time, what a p-value is and why p-hacking is serious. It's also good for getting a grip on just how seriously sample size affects power. Therefore i'd go for teaching via R, but it's all about how you do that. I'd say that if beginners are being exposed to ggplot2 and pipes, then you're doing it wrong. The R needs to be as simple as is compatible with the statistics you are learning, with exercises that they can work through one line at a time: then they can run the code, look at the output, tweak the code, see what happens If they are natural coders, you can point them to books that will explain how to write elegant scripts, but I think for ease of understanding, clunky scripts can be better. I'm trying to develop teaching scripts myself and always interested in feedback: see https://github.com/oscci/deevybee_repo. I would not base any decisions on these kinds of data—even tentatively. Self-efficacy is a terrible predictor of performance (Dunning-Kruger, etc.). Both the quantitative and qualitative data reflect the impact of prior knowledge on confidence, which is a very different hypothetical than coding with R enhances statistics learning outcomes. Also, if we care about diversification of STEM fields for which statistics is an entry point, orienting a course toward coding will give an increased confidence advantage to people with prior computing backgrounds at the expense of those without. Those individuals with these backgrounds are vastly more likely to be white, male, and from upper SES ranges. Those without are the people whom we struggle to bring into computationally intensive fields. - I realize that self-rated skill is not a great predictor of actual performance, but in some ways I am just as interested in self-efficacy here as I am in actual skill. 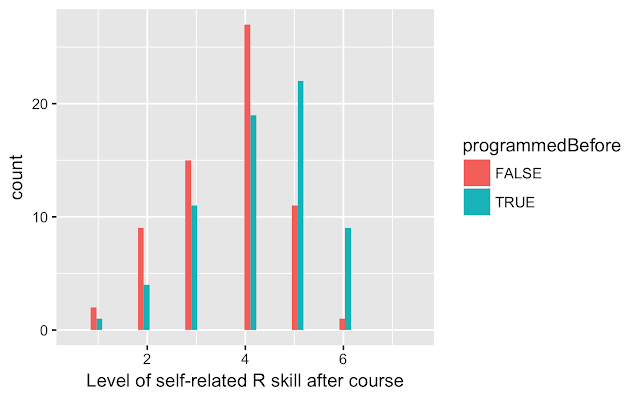 no one is going to become a highly skilled R programmer after just 10 weeks, but if they feel like they have some base skill on which they can build then they are more likely to pursue additional training in the future. My first question would be demographics not only majors in Liberal Arts etc but Elective or non-elective: Grad or undergrad. What are students hoping to get out of the course. Statistics and programming (both) are complementary skills for a wide variety jobs. A self-rating might imply a correlation for what students hoped to gain from electing the course. I would also not assume SES or class as a stronger correlation for learning than choice and other motivations on what the students hope to get out of the course so offering basic skills and self-rating indicate an appreciation to both fields they may pursue further. A worthy statistical objective. i don't think this is true. in jamovi all the options you use to run an analysis, the data used, and the results are all bundled together in the same file. you can click on an earlier analysis, and see the options which were used. better, you can send a file to a colleague, they can open the file, and see what options you used. this makes reproducibility so simple, and people do it without even realising. i'd also mention that jamovi includes an 'R syntax mode', where it will output the equivalent R syntax. this lets you copy/paste it into R studio or the like. in this way, jamovi is a great way to ease people into using R.